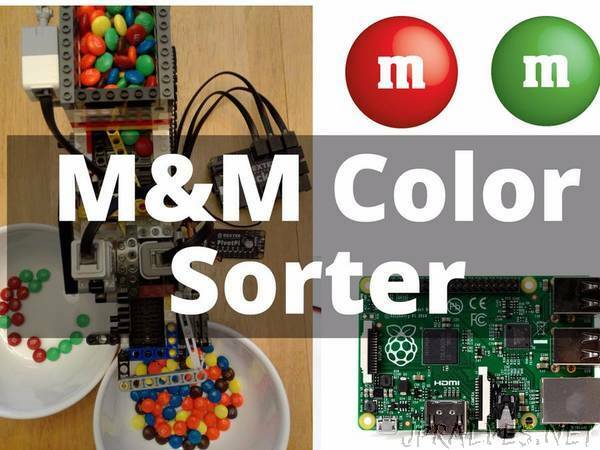 “In this project, we build a Raspberry Pi M&M Color Sorter to sort red and green M&M’s for Christmas! Need to sort out green and red M&M’s for the Christmas season? The Raspberry Pi M&M Color Sorter uses a Raspberry Pi with a BrickPi and PivotPi to sort out green and red M&M’s. The EV3 touch sensor acts as an on/off switch to control the EV3 motor that powers the conveyor belts to make the M&M’s pass one-by-one under an NXT color sensor. If an M&M is detected to be green or red, the servo extends an arm to pull the M&M off the side of the conveyor belt. Raspberry Pi – The Pi will run the sorting program, read the sensors, and control the motor and servo. PivotPi – The PivotPi allows the Raspberry Pi to control the servo. LEGO parts – The M&M’s sorter is built out of an assortment of LEGO parts, including a motor, color sensor, and touch sensor. Servo – The servo is used to move the arm to pull the green and red M&M’s off the conveyor belt. Power Supply – The BrickPi needs a 9v power supply to power the motor and Raspberry Pi. The PivotPi needs a 6v power supply to power the servo. The included BrickPi and PivotPi battery packs will work well. Raspbian for Robots SD Card – The Raspberry Pi runs Raspbian for Robots. You can download the software for free.